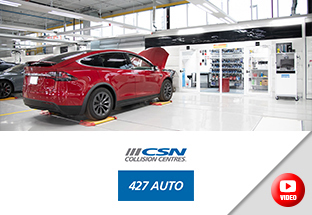 Symach announced today that CSN 427 Auto Collision is utilizing its complete body shop solution at its recently-renovated location in Toronto, Ontario. This includes Symach’s unique FixLine repair process and state-of-the-art equipment. “We incorporated Symach technology in our facility because the quality behind the Symach process helps us with efficiency,” said Lorenzo D’Alessandro, president of CSN 427 Auto Collision. “By utilizing Symach equipment, we can reduce our cycle time while streamlining our process so that we have a more consistent and predictable outcome. With predictability, comes better flow in the shop and less stress.” “We are excited to offer our new repair process to CSN 427 Auto Collision,” said Osvaldo Bergaglio, founder of Symach. “Lorenzo and his brothers operate a progressive body shop in Canada, and by using the FixLine system, it will reduce cycle time by two days.” Lorenzo’s father, Ralph, founded the body shop more than 45 years ago in a 2,500-square-foot facility near the 427 Highway, which prompted Ralph to name the business 427 Auto Collision. Lorenzo began helping at the shop when he was a teenager and by 1982 he was working there full-time. After outgrowing that location, they relocated to a 30,000-square-foot facility just down the road. As the company grew, they decided to purchase the building next door so they could expand their operations. Since then, Lorenzo has operated the 95,000-square-foot facility with his brothers Frank, VP of operations, and John, VP of sales. In 2002, Lorenzo, along with three other successful collision repair owners, co-founded CSN Collision Centres. CSN Collision Centres has grown to become a national network of collision repair centres with 350 locations across the country. “We established CSN Collision Centres to form a like-minded group of collision repair centres that wanted to focus on continuously improving their operations through performance assessments, ongoing training and marketing initiatives,” he said. A few years ago, one of his partners at CSN Collision Centres was installing Symach equipment at his shop (CSN Cars in Burlington, ON) and Lorenzo wanted to learn more. After visiting the operation many times and watching the Symach process first-hand, all three of the D’Alessandro brothers were impressed with the innovation behind the technology and decided to incorporate the equipment in their facility. “I found that the equipment was very advanced,” said Lorenzo. “It’s not just better equipment than what is on the market, but it’s also a better process. There aren’t too many equipment companies that offer the whole package like Symach does.” The CSN 427 Auto Collision Fixline system is the total Symach package. It consists of multiple Drying Robots, including both the FlyDry and DryTron models, a KombiTron spray booth with an attached drying cabin, 15 bays equipped with Symach’s technologically-advanced Car Lifts, as well as the Symach Multibox, Car Movers and Car Wash system. They have already found that the new approach has cut down repair time in the shop. CSN 427 Auto Collision is currently averaging about 10 vehicles a day through the Symach system. The goal is to achieve a maximum of 17 cars a day, which they hope to reach after hiring additional staff. The team at CSN 427 Auto Collision is focused on repairing vehicles properly and getting car owners back on the road safely. “Our priority is to continuously learn and improve. We pride ourselves on staying up-to-date with training, certifications and embracing new technology such as the Symach system,” Lorenzo added. About Symach: Symach was founded by Osvaldo Bergaglio in 2001. 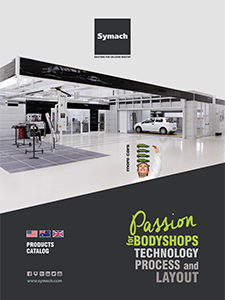 The Italian-based company offers a complete range of body shop equipment for the collision repair industry, including its unique FixLine repair process, SPP “Symach Paint Process” and DryTronic technology for drying paint in a less than a minute. “As an industry, we can never stop seeking improvement not only in technology, but also in the way we do work,” said Giarrizzo. “This is truly tomorrow’s technology and groundbreaking for the industry. The folks at Symach are innovators—they are engineers and inventors and so are we, making it a powerful relationship.” About Symach: Symach was founded by Osvaldo Bergaglio in 2001. The Italian-based company offers a complete range of body shop equipment for the collision repair industry, including its unique FixLine repair process, SPP “Symach Paint Process” and DryTronic technology for drying paint in a less than a minute. About DCR Systems: Founded in 2004, DCR Systems is based in Ohio and Atlanta and is owned by Michael Giarrizzo and partners. The company sets up accident repair facilities based on lean manufacturing principles for automotive dealerships looking to outsource their operations.